If you are like me, you need a little music to jump start your workout. I love to workout to music. It actually helps me focus. Weird, I know, considering the music I listen to while working out is usually fast beat, fun dance type music. But regardless, it focuses me. I pay more attention to my breathing, I can find my stride with the beat and it's all around fun. BUT and that's a big but, because I hate headphones with wires. They bounce around while working out. They tend to pull out the ear buds out of my ears which is annoying in every sense of the word. Sometimes, they have eve dared to smack me in the face. It's like they are taking their wrath of being in my ear out on me. They just don't work for me. That is why I love my Motorola Wireless S10-HD Headphones. Alot of people have asked me where I have I bought mine and I couldn't honestly remember. But I found them on Amazon! Your search is over. I love this style because they are light weight, they stay in your ear since they are designed to "hug" your ear and the are easy to clean too. This is important if you are like me because I apparently sweat profusely on my head! They also come with different size ear buds, since every one's ears are different sizes. The head phones are easy to charge. Just like a cell phone, they have a input to get charged. 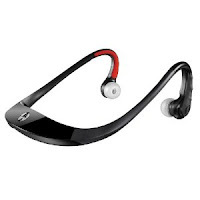 The headphones connect with bluetooth to most devices. Easy to use, fun to have! Stop fighting the wires! !